One interesting find at Laodicea in a large house just off Syria Street, was this filter connected to indoor plumbing. Water Filter at Laodicea. Photo ©Leon Mauldin. The right side and center is for water entering the building, while the left side is designed for water leaving the building. In another post we want to discuss further the water situation at Laodicea. 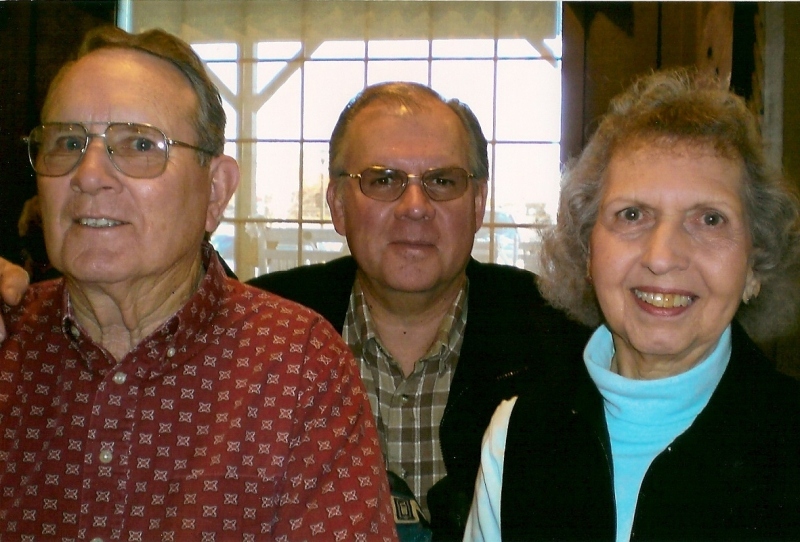 In our articles/photos posted on the Seven Churches of Rev. 2-3, we have repeatedly seen evidence of temples devoted to various pagan gods. It is difficult to overstate how widespread and pervasive idolatry was in the biblical world, in both Old Testament as well as New Testament times. 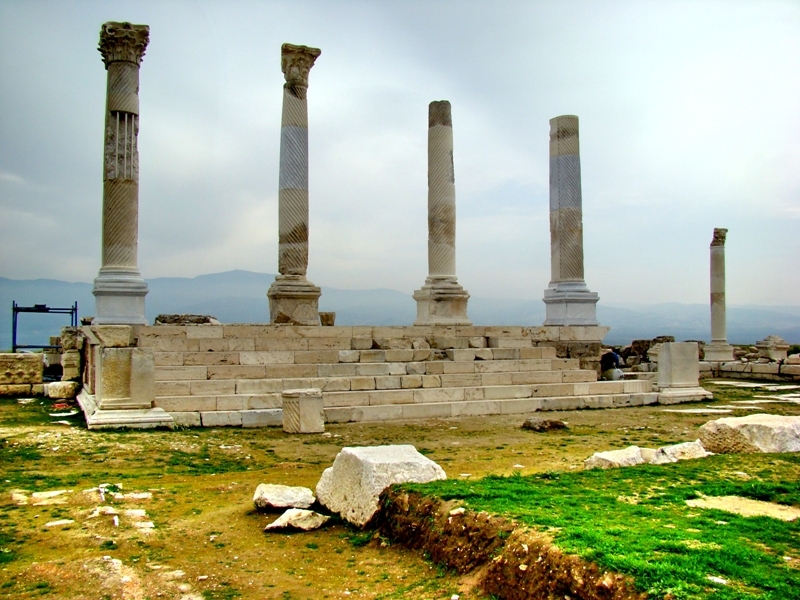 At Laodicea one can see the remains of a temple, known as Temple A, located on the north side of the city. 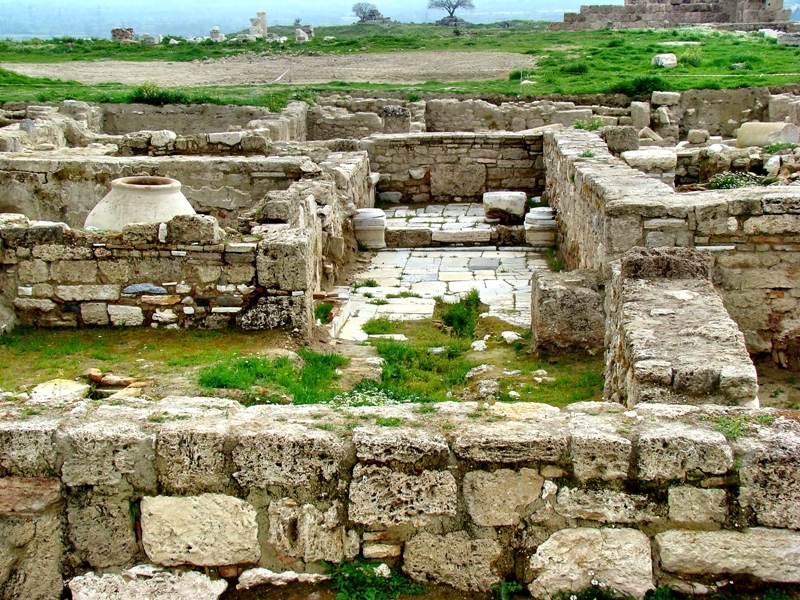 Temple A. Laodicea. Photo ©Leon Mauldin. Of course, every city of significance had a theater. 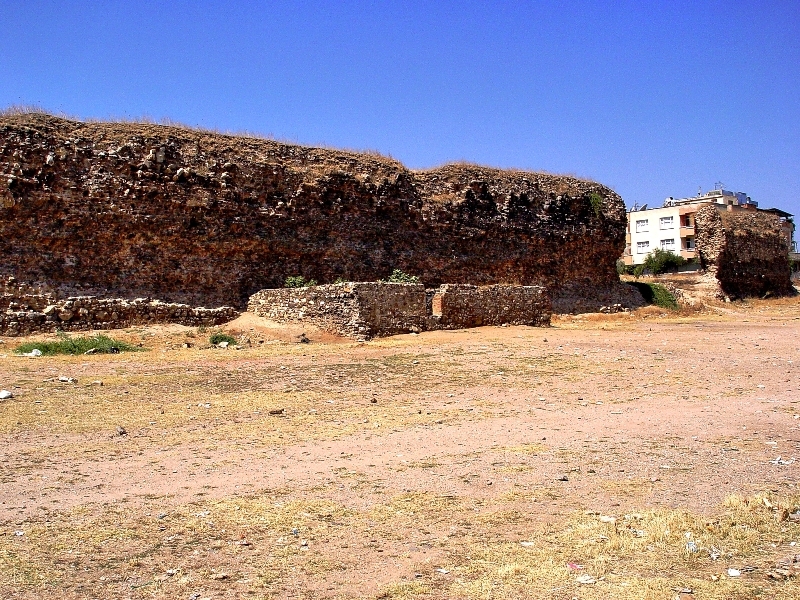 Pictured here is the Hellenistic theater, located on the west side of the city. Hellenistic Theater at Laodicea. Photo ©Leon Mauldin. Click on image for larger view. More to come. In our previous post we saw a startling difference between the Laodiceans’ assessment of themselves, and the Lord’s evaluation. They thought they were rich and in need of nothing; Jesus said that spiritually they were “wretched, pitiful, poor, blind, and naked” (Rev.3:17). They were blissfully unaware of their true condition before God! Further, their lukewarmness was a condition that nauseated the Lord. That’s why we have the Bible. Therein is revealed how to be saved by the provisions of God in Jesus Christ, and then further teaching furnishes the Christian with what God wants His people to be. In other words, to avoid the condemnation of the Lord, and to have His approval, requires constant looking at the Scriptures as the standard, and examining self in light of that Word. But we want to explore further the city itself where the church addressed in Rev. 3 was located. 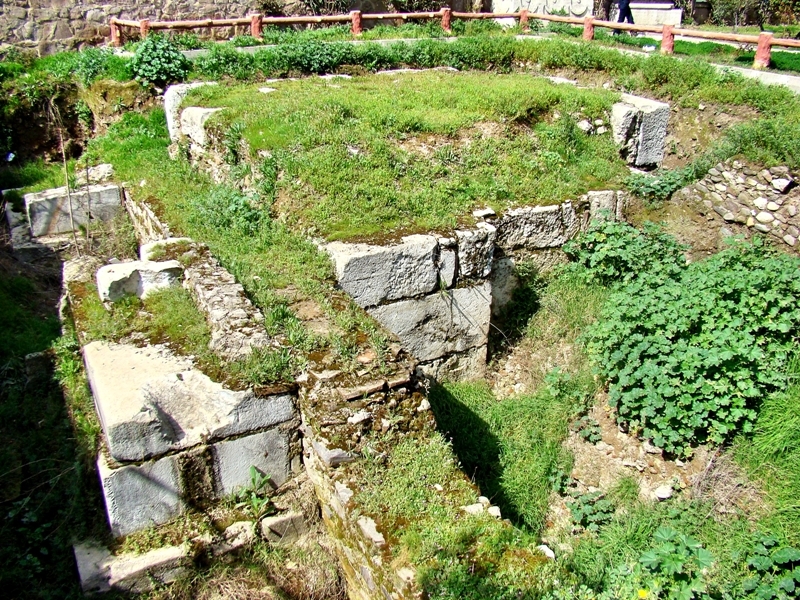 Besides the evidence of many public buildings and facilities, archaeologist have also excavated some private residences, such as the one in this photo. Note the storage jar at left center. Private Residence at Laodicea. Photo ©Leon Mauldin. Such storage jars would have been used in homes for storage of grain and other such items. Such items are indicative of considerable purchasing power. 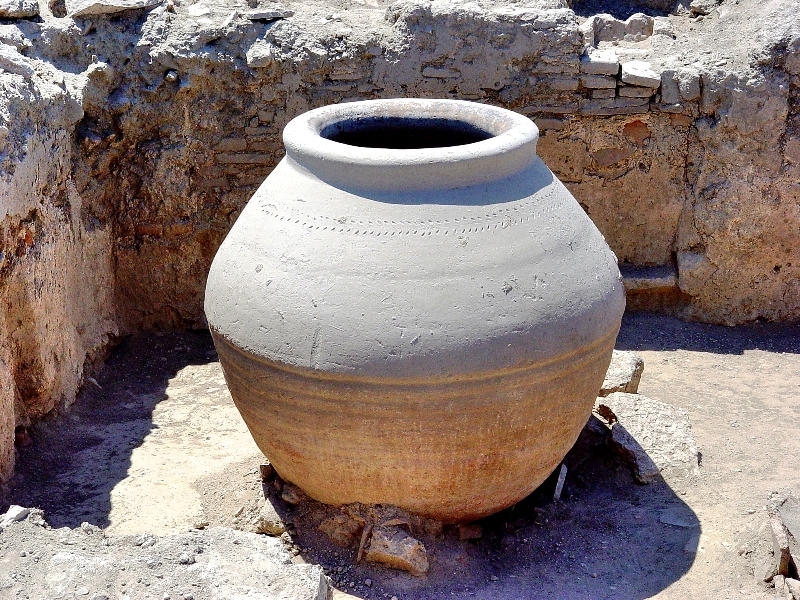 Storage Jar in Private Residence at Laodicea. Photo ©Leon Mauldin. Still more to come on Laodicea. Click on image for larger view. 15 ‘I know your deeds, that you are neither cold nor hot. I wish you were either cold or hot! 16 So because you are lukewarm, and neither hot nor cold, I am going to vomit you out of my mouth! 17 Because you say, “I am rich and have acquired great wealth, and need nothing,” but do not realize that you are wretched, pitiful, poor, blind, and naked, 18 take my advice and buy gold from me refined by fire so you can become rich! Buy from me white clothing so you can be clothed and your shameful nakedness will not be exposed, and buy eye salve to put on your eyes so you can see! (Rev. 3:15-18, NET). Since 2000, extensive excavation has been done at Laodicea, and continues through the present. Much of the work has been to reveal some of the major streets of the city, including the main street featured in our photo here. This street was called Syria Street. 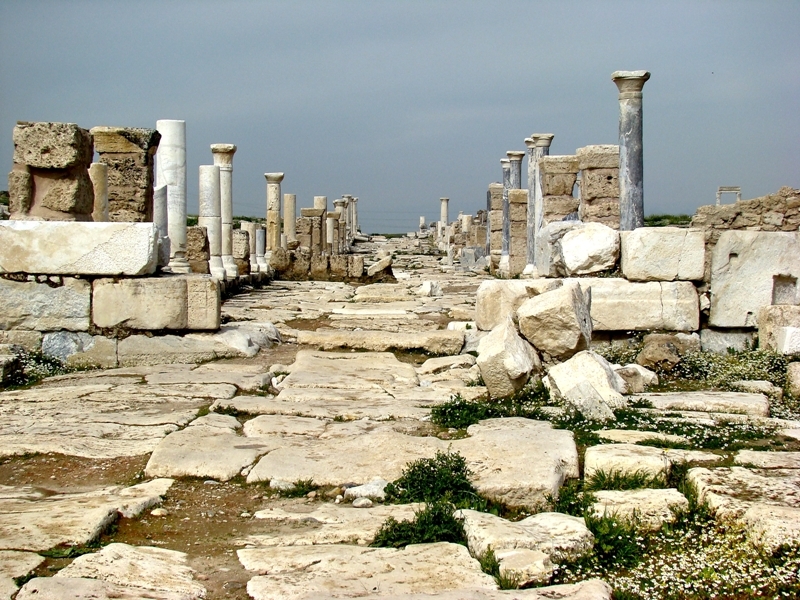 Laodicea Syria Street. Main Street in City. Photo ©Leon Mauldin. 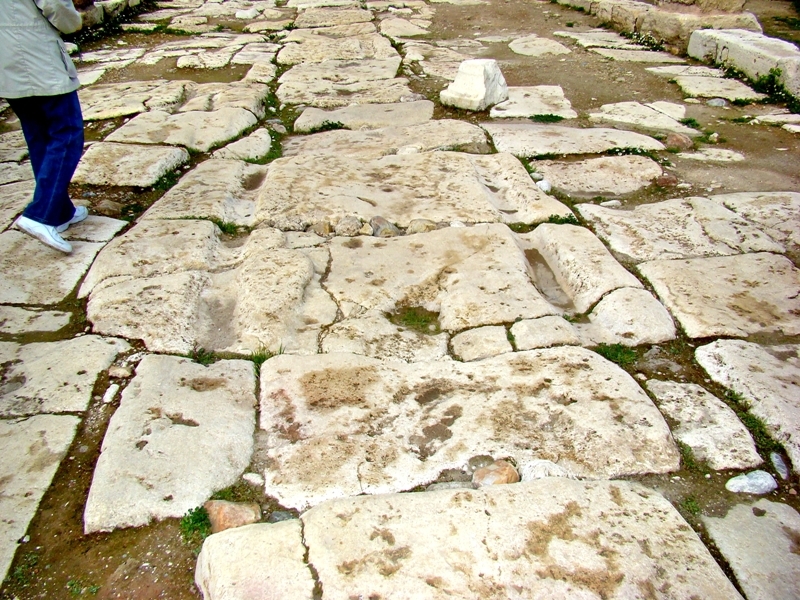 The scoring of pavement stones made by chariot wheels may be seen at some points in the street. Grooves in Street Made by Chariot Wheels. Photo ©Leon Mauldin. Syria Street as well as other streets would have been lined with shops on either side. 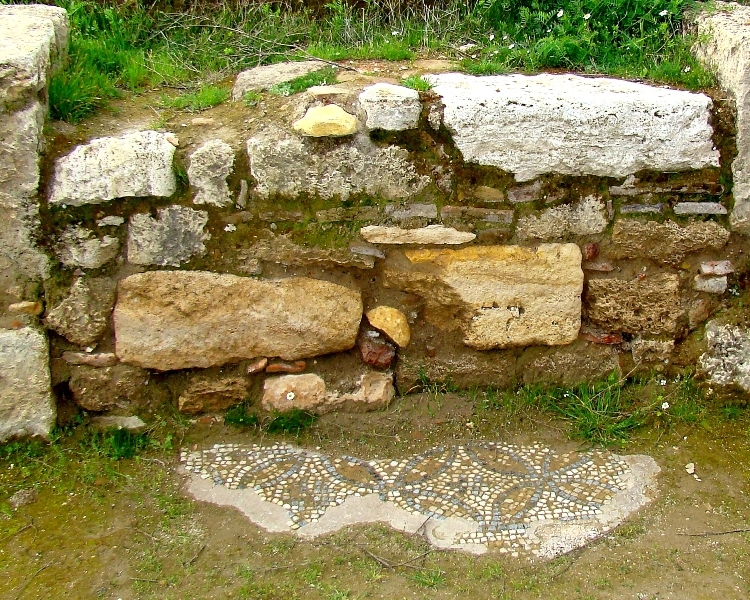 Our photo below depicts a mosaic at the entrance of an ancient shop. Laodicea Mosaic at Shop Entrance. Photo ©Leon Mauldin. More to come on Laodicea. Remember to click on photo for larger view. Recent posts have featured the biblical city of Philadelphia, one of the cities with churches addressed in Rev. 2-3. 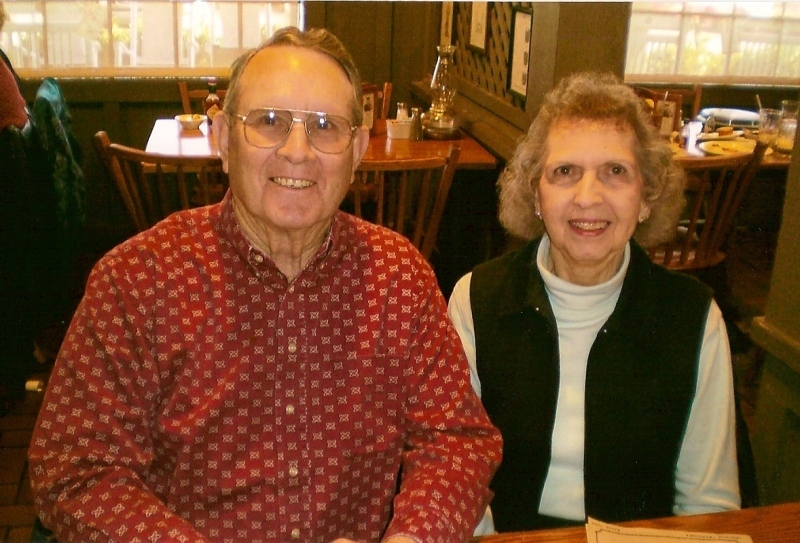 The Lord had only good things to say about two of those churches — Smyrna and Philadelphia. Bear in mind that when we speak of churches we are not referring to church buildings, but the people, Christians, who made up those local congregations. Note this artifact found at Philadelphia. Oxen and Garlands at Philadelphia. Photo ©Leon Mauldin. When the crowds saw what Paul had done, they raised their voice, saying in the Lycaonian language, “The gods have become like men and have come down to us.” And they began calling Barnabas, Zeus, and Paul, Hermes, because he was the chief speaker. 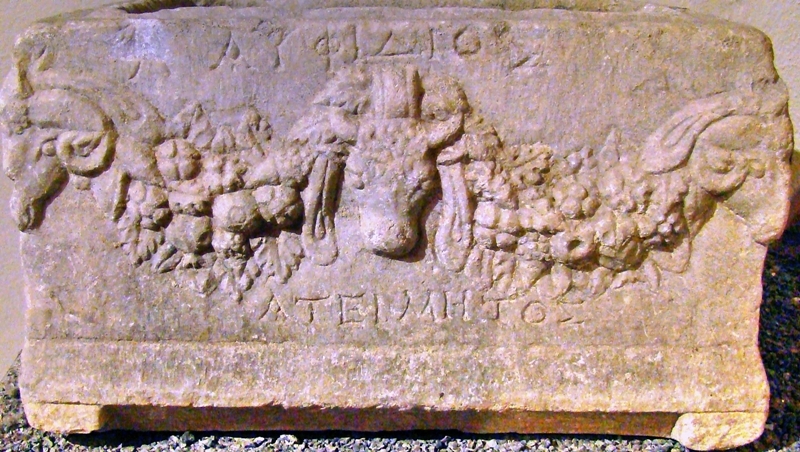 The priest of Zeus, whose temple was just outside the city, brought oxen and garlands to the gates, and wanted to offer sacrifice with the crowds. 14 But when the apostles Barnabas and Paul heard of it, they tore their robes and rushed out into the crowd, crying out and saying, “Men, why are you doing these things? We are also men of the same nature as you, and preach the gospel to you that you should turn from these vain things to a living God, WHO MADE THE HEAVEN AND THE EARTH AND THE SEA AND ALL THAT IS IN THEM. “In the generations gone by He permitted all the nations to go their own ways; and yet He did not leave Himself without witness, in that He did good and gave you rains from heaven and fruitful seasons, satisfying your hearts with food and gladness.” Even saying these things, with difficulty they restrained the crowds from offering sacrifice to them. Oxen and Garlands. Ephesus Museum. Photo ©Leon Mauldin. In this photo, note that rams appear on either side, with the ox in the middle. Click on image for larger view. Next we plan to visit Laodicia. We continue in today’s post to explore biblical Philadelphia, the sixth of the seven cities with churches addressed in Rev. 2-3. Volcanic activity has contributed to the fertility of the soil. 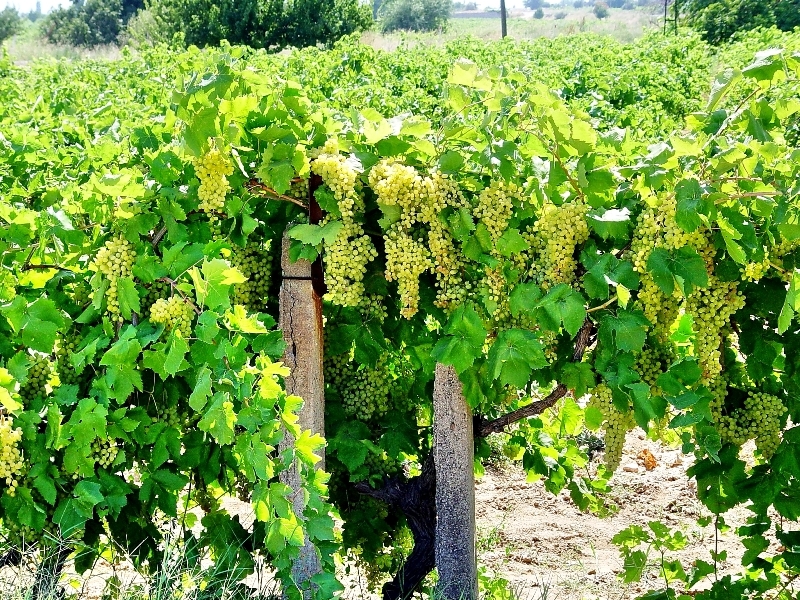 In ancient times as well as the present, Philadelphia is well suited for vineyards. See our photo below. Vineyards at Philadelphia. Photo ©Leon Mauldin. 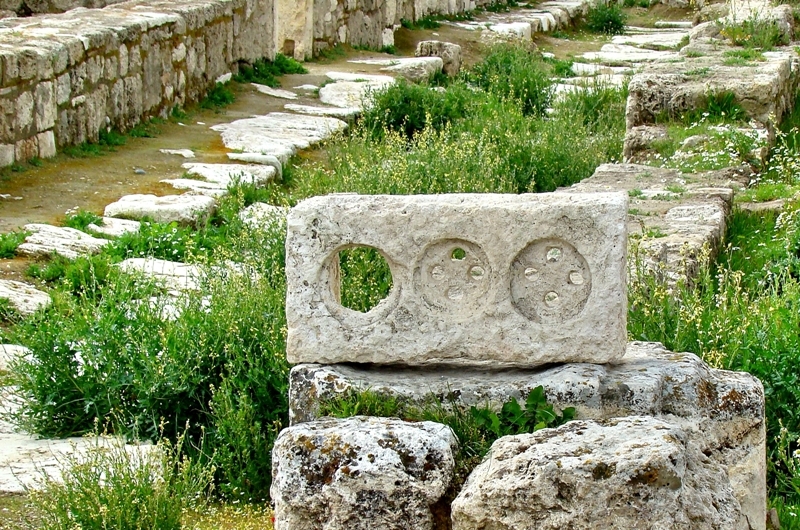 At the acropolis one may see a few artifacts of interest, such as this architrave fragment. 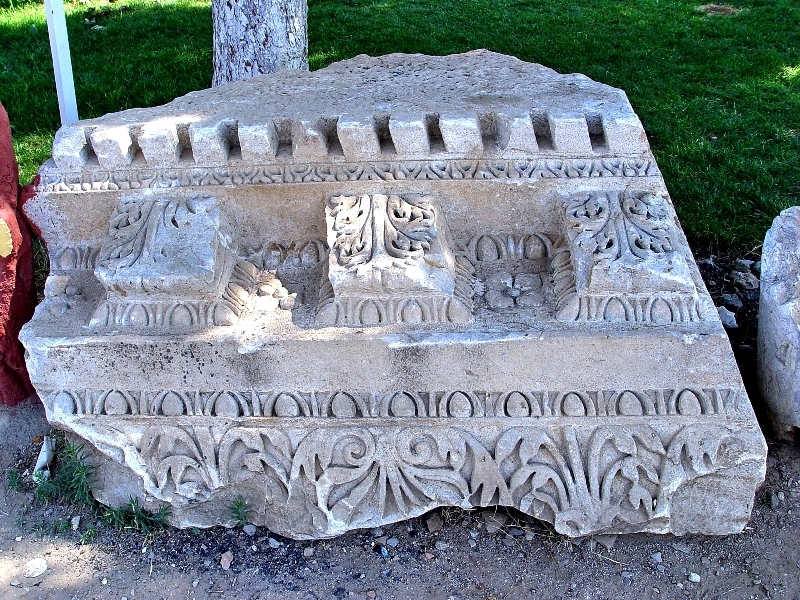 Architrave Fragment at Philadelphia. Photo ©Leon Mauldin. 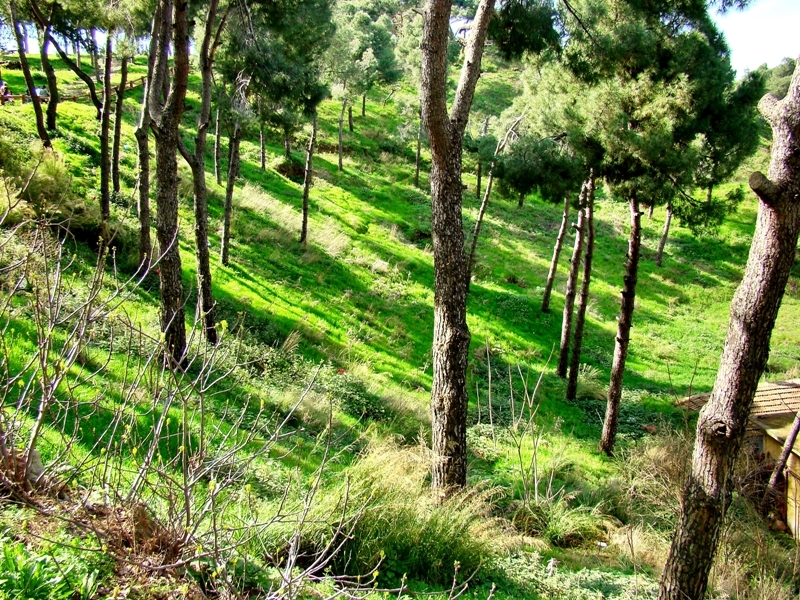 One may also view an ancient wall, as seen in our photo. Ancient Wall in Philadelphia. Photo ©Leon Mauldin. A woman walked by in front of that wall. Apparently she was gathering material for a broom. 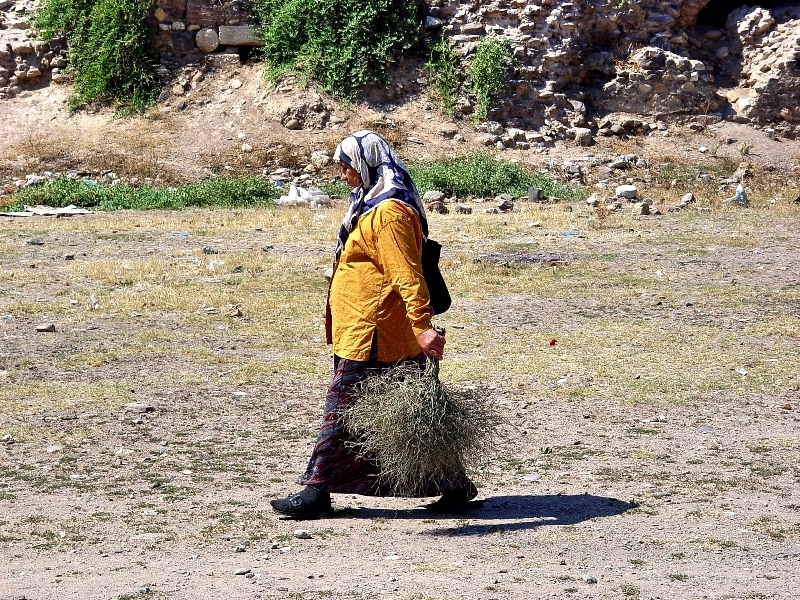 Woman with broom materials at Philadelphia. Photo ©Leon Mauldin. 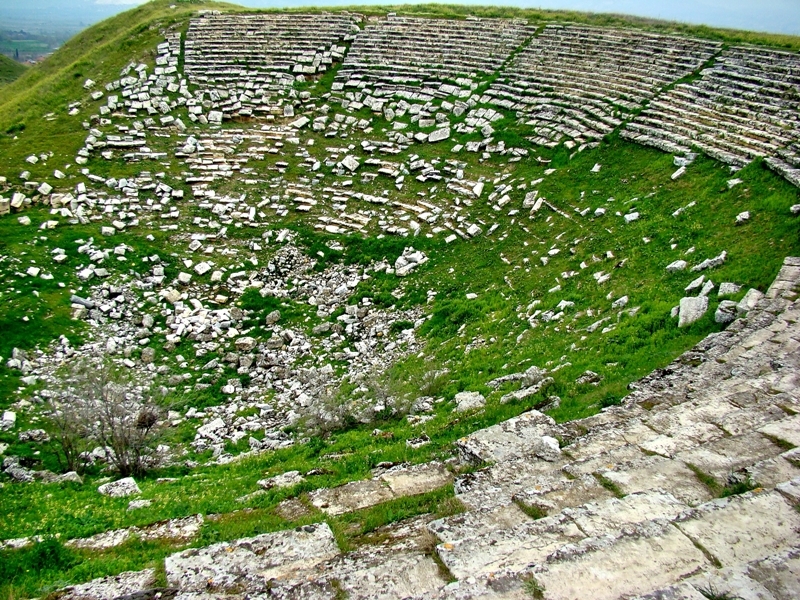 Every ancient city of significance had a theater. The one at Philadelphia has not been excavated, but its slope and semi-circular form can easily be detected. Unexcavated Theater at Philadelphia. Photo ©Leon Mauldin. 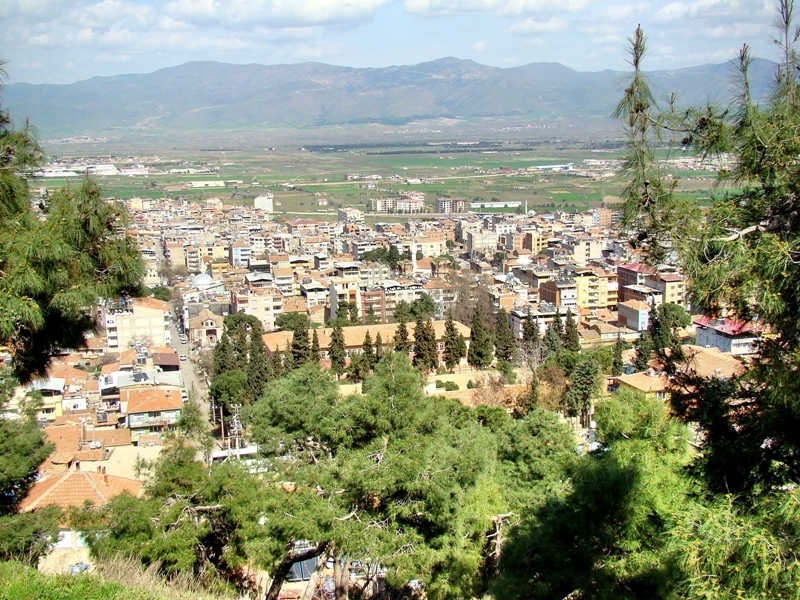 We continue to give attention to the cities of the Seven Churches addressed in Rev. 2-3, looking now at Philadelphia, modern Alasehir. The churches at Philadelphia and Smyrna were both commended by the Lord; there were no charges of wrong doing against either congregation. Further, Jesus said, “Look! I have put in front of you an open door that no one can shut” (Rev.3:8). Many biblical students believe that the “open door” refers to Philadelphia’s location, on the great trade-route from Smyrna to the highlands of Phrygia. Their faithfulness would be rewarded by further opportunities to proclaim the gospel to the many merchants and other travelers passing through this strategic site. 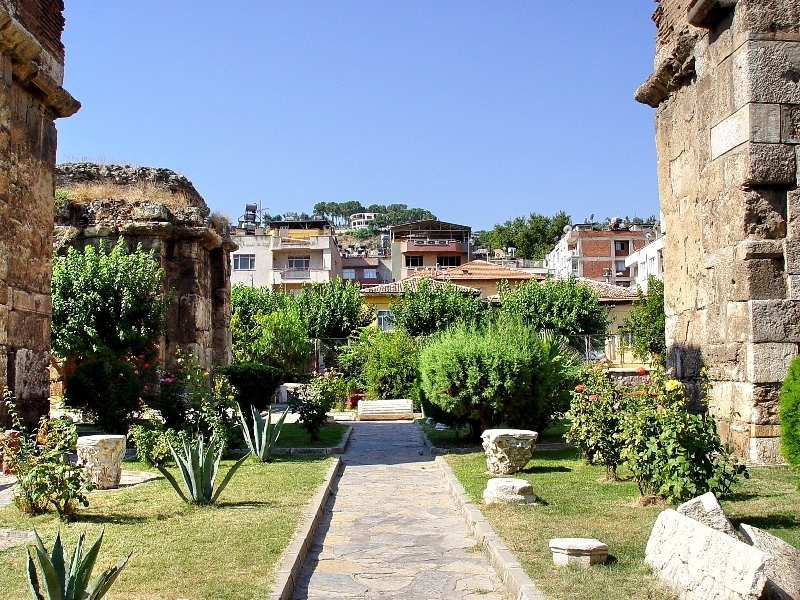 Our photo below shows view from the lower city, looking between Byzantine columns (Church of St. John), looking up to the acropolis. Philadelphia. View from lower city facing acropolis. Photo by Leon Mauldin. Very little excavation has been done in Philadelphia. In photo below you can see some of the excavated area. Limited excavations at Philidelphia. Photo by Leon Mauldin. From the acropolis looking down one has a good view of Philadelphia. Philadelphia modern Alasehir. View from acropolis. Photo by Leon Mauldin. Click on image for larger view. More to come on Philadelphia. You are currently browsing the Leon's Message Board blog archives for June, 2010.